Tzipi Livni was foreign minister during Israel's three-week offensive against Hamas in Gaza a year ago. Details of warrant not immediately available, but Israeli PM slammed bid to label Israeli officials as "war criminals"
Jerusalem (CNN) -- A British court's decision to issue an arrest warrant for former Israeli Foreign Minister Tzipi Livni is "absurd," Israeli Prime Minister Benjamin Netanyahu said Tuesday. Details of the arrest warrant were not immediately available -- news reports said it has been revoked -- but the prime minister denounced attempts to label Israeli officials as "war criminals." "We will not accept that (Israeli) soldiers and commanders that bravely and morally defended our citizens from a cruel enemy will be called war criminals," he said. "We reject this as absurd." Livni was Israel's foreign minister during the Israeli military offensive in Gaza a year ago. The United Nations and some human-rights groups have blamed Israel and Hamas for human rights abuses during the conflict. Israeli National Security Adviser Uzi Arad told the British ambassador "that the state of Israel expects that the government of Britain act against this immoral phenomenon that attempts to hamper Israel's right to defend herself," Netanyahu said in a statement. Netanyahu said Israel "will not accept a situation" in which Livni, Defense Minister Ehud Barak and former Prime Minister Ehud Olmert "will be summoned to the dock." Olmert was prime minister during Israel's three-week offensive against Hamas in Gaza a year ago. Britain's Foreign Office said the United Kingdom was not trying to hamper the peace process. "The UK is determined to do all it can to promote peace in the Middle East, and to be a strategic partner of Israel," the Foreign Office said in a statement. "To do this, Israel's leaders need to be able to come to the UK for talks with the British government. We are looking urgently at the implications of this case." It was not clear who sought the warrant from Westminster Magistrates Court. A Foreign Office spokesman said the warrant did not require ministerial approval; it was issued at the court's discretion. The arrest warrant was revoked once it was clear Livni was not in Britain, BBC News reported. A diplomatic source familiar with the case told CNN that Westminster Magistrates' Court in London issued the warrant "recently." The Crown Prosecution Service, however, told CNN it could not confirm or deny the existence of any arrest warrant. Israel said the warrant was issued "at the behest of radical elements" and "anti-Israel elements." "This arrest warrant makes a mockery of universal jurisdiction," said Israeli Deputy Foreign Minister Daniel Ayalon, who was also the subject of a potential arrest warrant when he visited the United Kingdom last month. "There are those in the international community who are trying to single out Israel in its fight against terrorism." Ayalon added: "I don't see how Israelis and other officials can continue to visit the U.K. if this troublesome situation continues." Livni had been invited to participate in a conference in England but turned down the offer two weeks ago because of a scheduling conflict, according to her office. 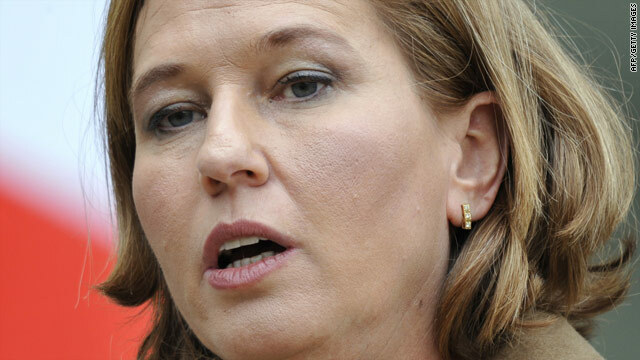 The statement said further that Livni had no knowledge that a warrant would be issued when she declined the invitation. Two months ago, British lawyers working on behalf of 16 Palestinian clients petitioned a London court to issue an arrest warrant for Israeli Defense Minister Ehud Barak while he was on an official visit in London. The court ruled that Barak enjoyed immunity while on official state business. CNN's Kevin Flower and Jonathan Wald contributed to this report.